Uh-oh! 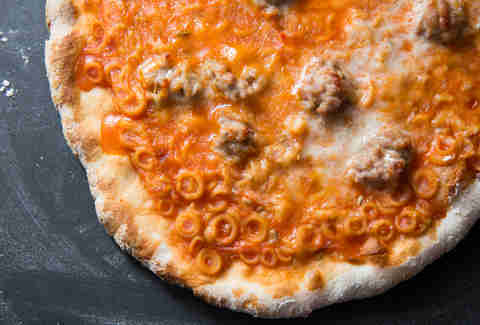 SpaghettiOs pizza is freaking delicious! 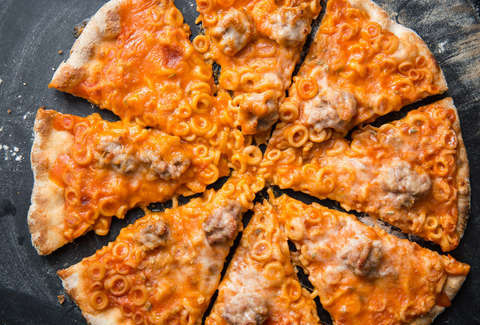 There is no shame in eating SpaghettiOs as an adult, especially as a pizza topping. It’s just like pizza sauce... with texture. And it’s still just as exciting when you find three different-sized O’s neatly nestled within each other. While you could use SpaghettiOs with Meatballs, the sweet tomato sauce actually pairs much better with the spicy kick you get from subbing in fresh Italian sausage. Add shredded mozzarella, and you basically have a gourmet meal. How Do You Make Pizza and Donuts Better? Pizza Donuts. Set a pizza stone on a rack in the top-third of the oven. Preheat the oven to 500° for at least 45 minutes. Meanwhile, let pizza dough sit at room temperature for 20 minutes. Working on a floured surface and using your fingers, press and stretch the dough ball out to a 12-inch round, working from the center toward the edge; avoid pressing on the outermost edge. Transfer the dough to a floured pizza peel. Lightly brush the dough with olive oil. Spread SpaghettiOs on the dough, leaving a 1-inch border around the edge. Sprinkle with fennel seeds and mozzarella. Top with sausage, breaking the meat into bite-size pieces. Slide the pizza off the peel and onto the pizza stone, opening and closing the oven door as quickly as possible. Bake until cheese is bubbly and crust is golden, about 8 minutes. Slide pizza back onto the peel to remove from oven. Cut into 8 slices, and serve immediately.